Tasting the New Zealand Wines Again! 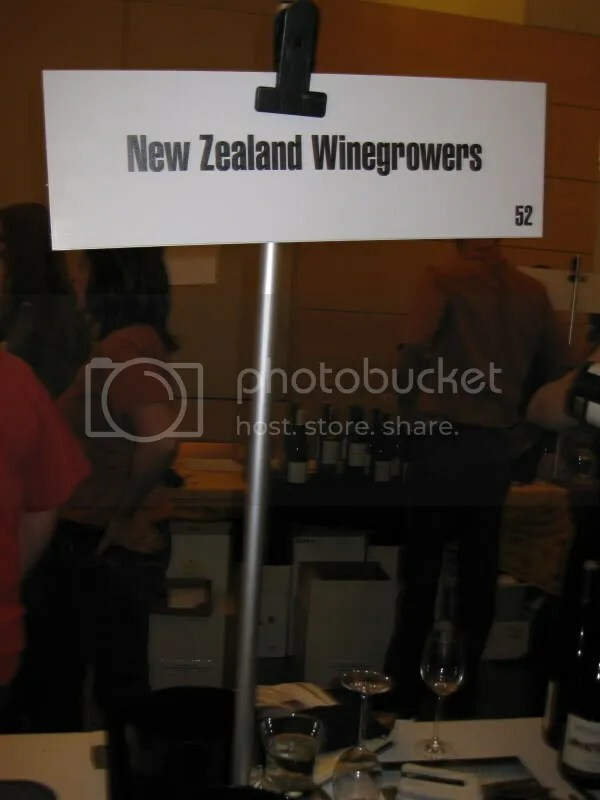 At the DC International Wine and Food Festival, I made sure to stop by the New Zealand Wine Growers table. I had the chance to free style taste some of their selections at the Wine Blogger Conference, but I only made it through a few there as my palate was just plain tuckered out by that point in the day. So I was excited to see them again, and am pleased to be attending their regional tasting at the end of March. 2008 Giesen Sauvignon Blanc: Gooseberry, grapefruit, citrus, very nice. 2008 Stoneleigh Sauvignon Blanc: Green pepper, gooseberry, very sitrus, herbal notes. 2008 Giesen Three Brothers Sauvignon Blanc: Peach, citrus, gooseberries, very tart, nice tropical notes. 2008 Brancott Reserve Sauvignon Blanc: Lemon, citrus, grass, crisp, nicely done. 2007 Wither Hills Sauvignon Blanc: Bright, floral, tropical, pear, lemon, crisp, tongue tingly. 2007 Staete Landt Pinot Gris: Pear, lemon, honey, apple, light. 2004 Vinoptima Gewurztraminer: Lychee, apricot, white peach, grassy, hay, honey. 2007 Stoneleigh Pinot Noir: Cherry cola, flowers, violets, cherry, raspberry, vanilla, very light, easy to drink. 2006 Brancott Reserve Pinot Noir: Earth, Coke, raspberry, cherry, bright fruit. 2005 Wither Hills Pinot Noir: Chocolate, berries, red fruit, sweet, cherry, raspberry, really nice in the mouth. At the DC Food and Wine Festival, I tried to quickly hit tables with wines I don’t get a lot of exposure to normally. 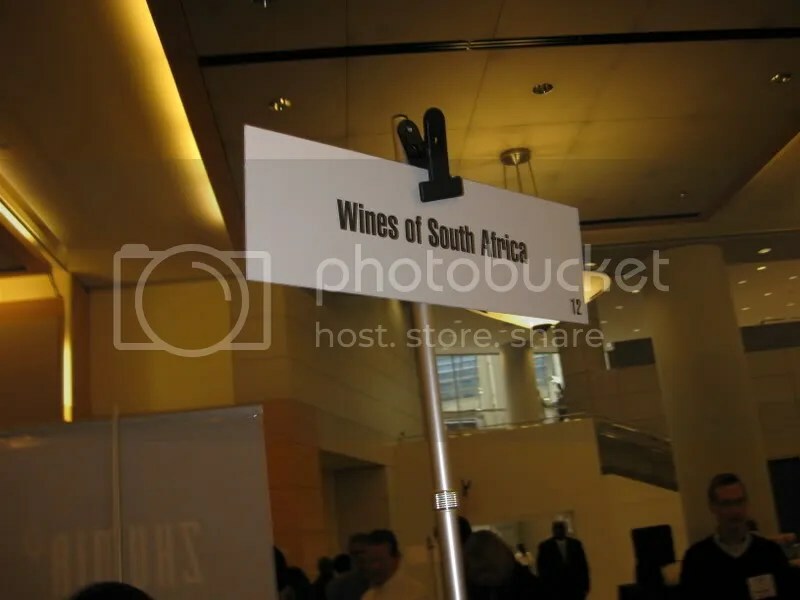 I’ve had a few wines from South Africa, but not very many, so I made a beeline for the Wines of South Africa table. I felt bad for the woman pouring the wines. She didn’t speak much English, and the person really running the table had left her there without even opening the bottles for her…she didn’t seem to know how to work a corkscrew, so I offered my considerable skills (hehehe) and popped the corks for her. Sadly, she didn’t really know anything about the wines, so I just tasted through and left quickly. 2008 Cederberg Bukettraube-This was a new grape for me…normally I’d add it to my Century Club application, but Matt and I are trying to finish our applications together, so we’re only counting grapes we both tried. Lemon, citrus, grapefruit, light, crisp, tastes like Sauvignon Blanc. 2008 Springfield Estate Sauvignon Blanc-Peppers, grapefruit, lemon, crisp, good acidity. 2003 Springfield Estate Wild West Chardonnay-Pear, apple, tropical, pineapple, crisp. 2008 Indaba Shiraz-Strawberry, plum, dry, not very fruity, reserved. 2007 Graham Beck Pinotage-Earthy, animal, strawberry, cherry. 2007 Koopmanskloof Pinotage-Dark chocolate, pepper, rose, meat, cedar, smoke. Really liked this one. 2007 Koopmanskloof Shiraz- Very woody, fruity, raisins, port like, finish falls off. An interesting selection. I would have liked to see more Sauvignon Blancs as I have tried some really nicely done ones from South Africa in the past. Wines that is! 😉 I rarely drink wine from Germany and it’s often a treat when I do to be exposed to some excellent Rieslings, (the wine that started my love affair with wine), and other fabulous white wines. This time I even got to try some German Pinot Noirs! 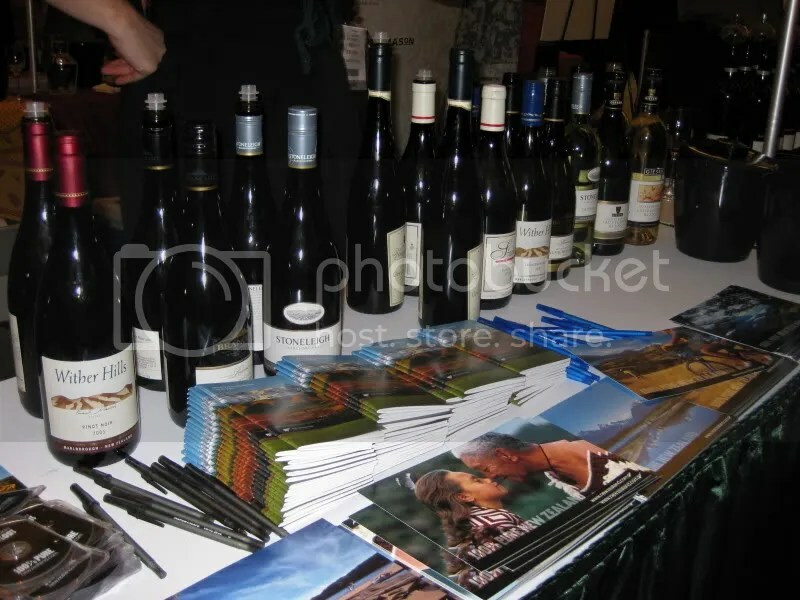 Last weekend I attended the DC International Wine and Food Festival on a press pass. This year, I only went for one day and I only stayed for the trade hours. I learned my lesson last year, it gets crowded as soon as the public comes in! However, this year, the place seemed incredibly crowded with just the trade and I only made it to 6 tables in 2 hours. Probably because I’d go to an empty table and then the same group of about 8 folks from a store would show up behind me and push me out of the way. No matter where I went, even when I went to an entirely different room, this same group kept tailing me!! 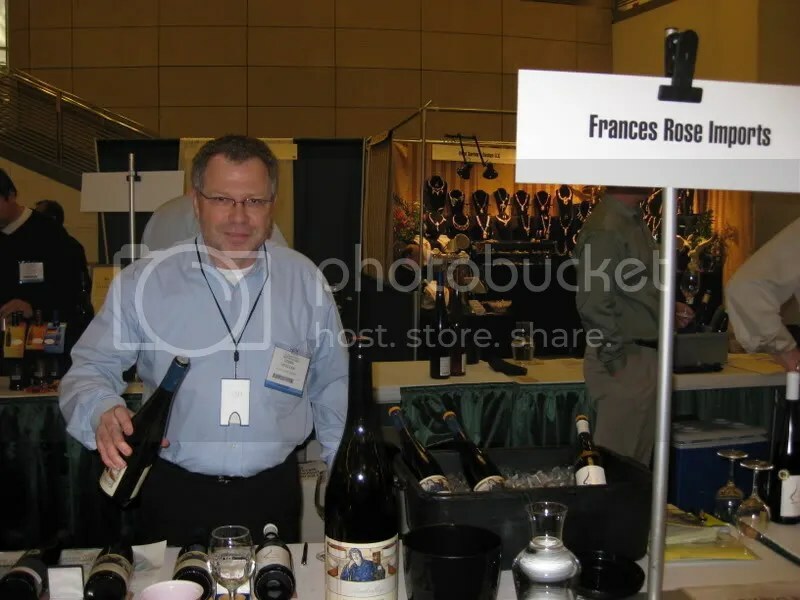 I started at the table for Frances Rose Imports, an importer based in Germany. 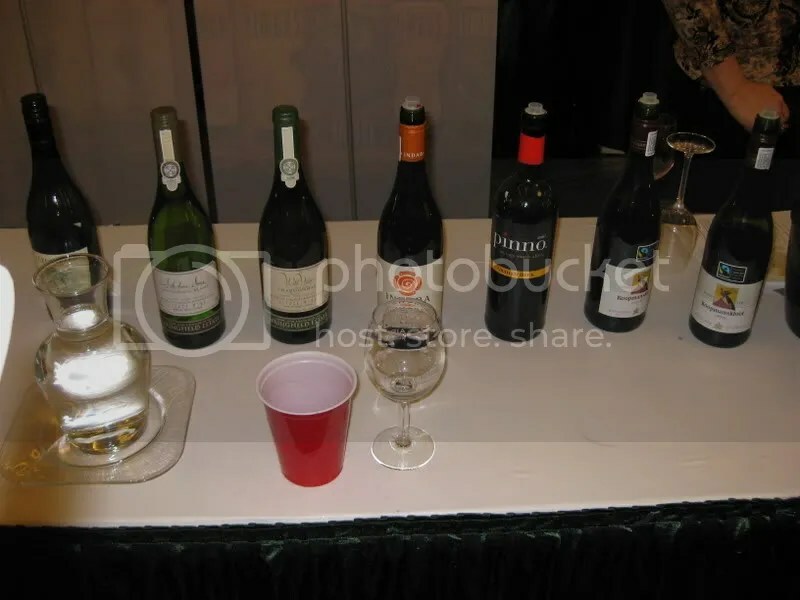 They actually had two tables with a total of around 10 wines, and were looking for a distributor in the DC area. So, if you area distributor, check out their selections, the wines were really tasty and well priced! 2007 Rotschiefer Baron Heyl Zu Hernsheim Riesling: Retails for between $25-$28. Lemon, honey, minerals, nice acidity. 2007 Baron Heyl Riesling: Retails in mid-$20s. Apricot, orange, very light nose, slight honey, slighly sweet, very nice minerality. 2007 Baron Heyl Riesling Spatlese: Lemon, minerals, honey, mandarin orange, nice acidity, on the sweeter side. 1999 Schwibinger Pinot Gris: Specializes in aged white wines. Retails for about $29. Pear, apple, very aromatic, honey, lots of tropical fruit. 2007 Thörie Pinot Noir: Cherry, floral, tart cherries, roses, red berries, earth, very clean flavors, austere. Retails for $20, great QPR. 2007 August Ziegler Spatburgunder aka Pinot Noir: Oaky, butterscotch, raspberry, cherry, tannic. All the following except the Auslese retail for under $20. 2006 Schwibinger Pinot Blanc: Perfumey, floral, lemon, clean, light, crisp, very nicely done. 2007 Schwibinger Riesling: floral, apricot, lemon, clean flavors, crisp. 2007 Thörie Riesling: Sweeter, honey, prickly on the tongue, citrus, lemon. 2005 Maikammerer Madelhöhe Gewurztraminer Spatlese: Lychee, almond, pineapple, mandarin, very nice. 2005 August Ziegler Riesling Auslese: Pear, apricot, nice acidity, orange, honeysuckle. A dessert wine you could drink many glasses of. Tasting all these lovely wines, many of which retail for fantastic prices, reminded me that I need to step outside of my CA comfort zone more often. Bone dry Rieslings can be a thing of beauty and I should really drink more of them! I realized shortly after heading to Sonoma that I had far too many posts left to make from the DC International Wine and Food Festival and the trip to Sonoma was only going to make me further behind on those. I was entirely right and found it more interesting to talk to you all about our actual experiences in Sonoma, so the posts about the Festival took a backseat. I still have plenty of vineyard visits from Sonoma to tell you about, but I’m going to throw one in now from the Festival. Though to be honest, we actually visited Alexander Valley Vineyards on our very first trip to Sonoma in 2006. I’ve reviewed some of their wines here before, most recently the delicious Cyrus for Open That Bottle Night. When I saw the vineyard at the Festival I was very interested to taste the new line-up, especially since OTBN had only been a few days before. 2006 Estate Chardonnay: 70% Stainless Steel, 30% Neutral barrel with no maloactic. Pineapple, pear, nicely done. 2005 Temptation Zin: 92% Zin, 8% Sangiovese. Strawberry, spice, dark berries, fruity. Well done, I liked this one. 2006 Sin Zin: Berry, spice, cherry, raspberry. 2005 Redemption Zin: Spicier than the others, with darker fruit, some leather. This one was all from Dry Creek Valley, where the Temptation is Dry Creek and Alexander Valley fruit and the Sin is all Alexander Valley fruit. 2005 Cabernet Sauvignon: Blended with Cabernet Franc and Merlot. Leather, red berries, funk, spicy, layered berries, fruitier as I swirled. I’ve quickly learned that if you actually pay attention and are interested in what the wineries have to offer, they like to talk to you and offer to let you taste special wines. With that in mind, I got to taste a special one from Alexander Valley Vineyards! 2004 Top of Crop Cabernet Sauvignon: 200 cases made, aged 18 months in oak, picked specially for the great fruit. This was a big wine with lots of dark fruit, spice, smoke, dark berries and chocolate. Very good. Note: This will be the first in a series of posts on the wineries I discovered at the D.C. International Wine and Food Festival. On my second day at the festival, I stopped by the booth for Jessie’s Grove Winery, a family owned winery located in Lodi, CA. I had 3 hours of trade tasting ahead of me, and this was my second stop for the day. Since I was at the festival the moment the doors opened, I felt like I had more leeway on the second day to stop and chat and learn more about the vineyards. 2006 Earth Zin and Fire: Retails for $12.99. I got vanilla, cream, berries, blackberries and an aftertaste of maple syrup, the kind you get from Vermont. 2005 Westwind Old Vine Zinfandel: Retails for $24.50 and is made from grapes from 65 year old vines. I found the wine to be spicy, with cherry and raspberry. 2005 Ancient Vine Carignane: Retails for $18.00. The label for this wine was designed by the owner’s mother, and was the original label for all the winery’s products. The wine is made from the vineyards planted in 1889! I found the wine to be smoky, with vanilla toast, currants, and dark red fruit. 2004 Petite Sirah: Retails for $24.50. Creamy, dark fruit, blueberry, smooth and ready to drink. Two other points of interest: Jessie’s Grove practices sustainable farming and their tasting room is housed in a building constructed in 1890! A very nice family operation, and some of my favorite wines tasted at the festival. I am back from 2 days spent at the DC International Wine and Food Festival! My lips are stained purple, my feet are killing me, and my hand is cramped from taking so many notes. I went on day one from 1 until about 5. One to two were the trade hours, and I would say I got the most done that day during that time. Once it opened up to the public it was much harder to get around, the aisles filled up and it was sometimes 4 to 5 people deep to get near the tables. I spent day one with John from Anything Wine which was great, it was fun to have someone to go around with and talk to as we were waiting or tasting! I was also psyched to meet John, I’ve been a long time reader of his blog and he is a frequent commentor here! Today I went by myself and pretty much only stayed for the trade hours from 11-2. Let me tell you, that was quite enough! I was going to stick around since it was open until 6, but I had visited a ton of booths, tasted many wines, and it got crowded the second they opened the doors. Some initial thoughts: Seating somewhere would have been nice. Especially today. After a full day yesterday my feet were killing me today, and after about an hour I really would have appreciated a bench. People are not very careful (or polite) when tasting in such a mass setting. On day one, a woman decided that the floor was her dump bucket, and without even a glance down she turned her glass over, and tipped it out. On my foot. Today I got spit on. Apparently someone was practicing their spitting technique? Or else was new to the concept of spitting….the same fellow also had a penchant to tip his glass in the direction of the dump bucket and just fling the wine….uh, yeah, that doesn’t work so well. Now, I’m all about getting out of the way as soon as I am done tasting, and once the public came in, I tasted quickly and moved out of the way. Sadly, that apparently wasn’t fast enough for some people who liked to shove and push their way to the front. I loved the trade hours since often I got to be the only person at a booth and could really talk to the person running it (some winemakers, some owners, some family members) and ask questions. I tasted through a ton of wines. I tried to focus on importers and vineyards that I hadn’t been to before, though I must admit, I dragged John to Rodney Strong yesterday, and I’m glad I did, since they weren’t there today! I skipped the VA Vineyards since I was familiar with many of them, and have visited a ton of them. Oddly enough, some of the places, both wineries and importers/distributors, just didn’t show up. There were tables for them, and signs up, and they were on the list, but they weren’t there. Notable on the first day to me was that Four Vines and Trentadue didn’t show. I didn’t have time to check if they were there today, but I did not notice them. Also, several of the wineries didn’t come back for the second day. I’m still figuring out how I want to break down the tastings I did for posts here, but I hope to start putting them up this week. Thanks to Craig Camp of The Wine Camp Blog for his assistance in getting me a press pass for this event! I will be attending both days of the festival, and look forward to visiting many of the over 200 wineries and vineyards that will be pouring their wines. I’m also hoping that John of Anything Wine will be able to attend as well, he was also granted press credentials, and it would be exciting to meet more Virginia Wine Bloggers! By the way, if you haven’t been checking out John’s blog, it’s definitely one to add to your list. The D.C. International Wine and Food Festival is scheduled for this Saturday and Sunday at the Reagan Building in D.C. The festival features around 240 exhibitors, both of wine, spirits, food, and other related items. I found this short list of featured Wineries/Vineyards/Distributors but cannot find a full list. Anyone have any suggestions of places not to miss based off the short list? Also, anyone have any thoughts on strategies for tackling such a large festival? I have not attended anything of this magnitude in the past! I’m thinking backpack instead of purse so I can have a hand free for my notebook and another for my wine glass, probably sneakers since I’ll be on my feet most of the day, dark clothes because I’m bound to spill on myself or be spilled on, I’m considering attaching my Nalgene to my backpack via my Carabiner Hook so I don’t have to be concerned about having a 3rd hand to carry a water bottle….Anything else anyone thinks I must do (besides the obvious of eating a solid breakfast/lunch and making sure to spit/dump and continue to eat while there! )?